The 16S rRNA gene of A. paucivorans GLU-3T shares 96% sequence identity with that of the type strain of Thermanaerovibrio acidaminovorans, which was isolated from an upflow anaerobic sludge bed reactor of a sugar refinery, Breda, the Netherlands  (Figure 1), and 82.2-96.4% sequence identity with the type strains from the other members of the family Synergistaceae . 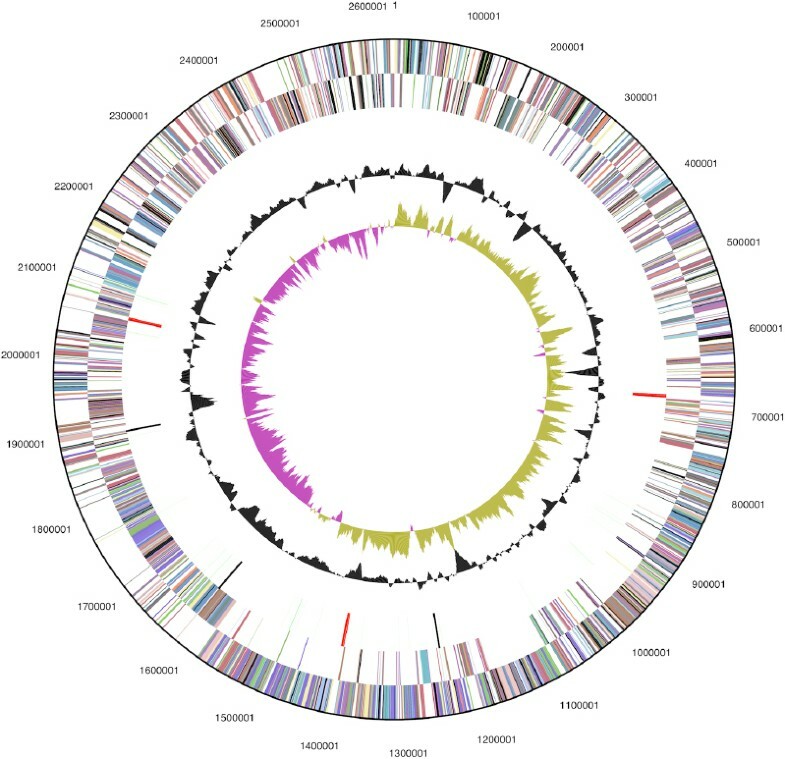 The sequences of four marine metagenomic clones in the env_nt database, 1096626071844 (AACY020063505), 1096626840052 (AACY020539193), 1096626748225 (AACY020105546) and 1096626774924 (AACY020274567) share 96% sequence identity with A. paucivorans GLU-3T (as of October 2010). A representative genomic 16S rRNA sequence of A. paucivorans was compared using NCBI BLAST under default values with the most recent release of the Greengenes database  and the relative frequencies of taxa and keywords, weighted by BLAST scores, were determined. The four most frequent genera were Thermanaerovibrio (65.5%), Aminomonas (18.0%), Anaerobaculum (9.0%) and Aminiphilus (7.6%). The species yielding the highest score was T. acidaminovorans. The five most frequent keywords within the labels of environmental samples which yielded hits were ‘anaerobic’ (7.2%), ‘sludge’ (6.9%), ‘wastewater’ (6.8%), ‘municipal’ (6.8%) and ‘digester’ (6.7%). These keywords corroborate the physiological and ecological features on strain GLU-3T as depicted in the original description .The single most frequent keyword within the labels of environmental samples which yielded hits of a higher score than the highest scoring species was ‘harbor/sediment’ (50.0%). A. paucivorans GLU-3T is described as Gram-negative, slightly curved, rod-shaped bacterium (0.3 × 4.0–6.0 µm), which occurs singly or in pairs (Figure 2 and Table 1). Colonies of strain GLU-3T are round, smooth and white, with a diameter up to 1 mm . Strain GLU-3T does not produce endospores . 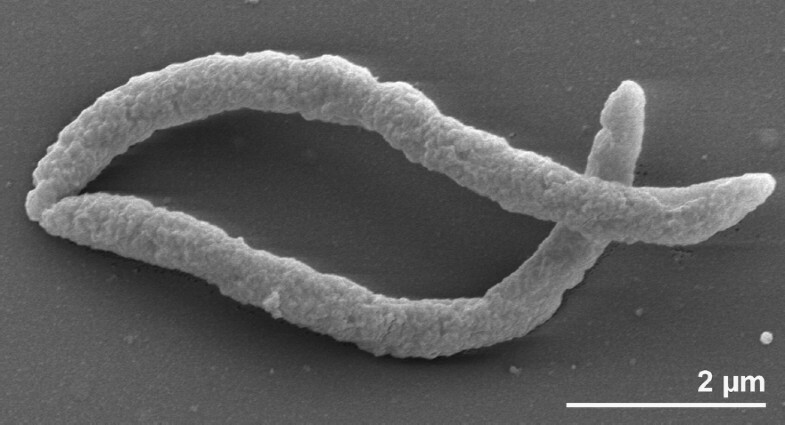 The organism does not have flagella and motility is not observed , although plenty of motility genes are present in the genome. Strain GLU-3T is a strictly anaerobic, mesophilic, chemoorganotrophic and asaccharolytic bacterium . The temperature range for growth is 20–40°C, with an optimum at 35°C . The pH range for growth is 6.7–8.3, with an optimum at 7.5 . The organism does not require NaCl for growth but tolerates up to 2.0% . The optimum growth occurs in media with 0.05–0.5% of NaCl . The species requires yeast extract for growth . The organism is able to ferment arginine, histidine, glutamine, threonine, and glycine . Arginine is fermented to acetate, formate and ornithine . Histidine is fermented to acetate and formate . Glutamate is fermented to acetate, formate and trace amounts of propionate . Threonine and glycine are fermented to acetate . Casamino acid, peptone and cysteine are only poorly used by the strain GLU-3T, and acetate is the end-product of the amino acid metabolism . A mixed culture of strain GLU-3T and Methanobacterium formicicum does not extend the range of substrate utilization , as is observed for, e.g., Aminobacterium colombiense - . Methane is not detectable in mixed cultures, when grown in glycine and threonine , however, the end-product profiles are the same as in pure culture . The major end-product is shifted from acetate to propionate, when strain GLU-3T was grown together with M. formicicum on arginine, histidine and glutamate . Ornithine is not accumulated during arginine degradation in mixed culture . Strain GLU-3T does not degrade alanine and branched-chain amino acids, valine, leucine and isoleucine either in pure culture or in syntrophic growth with M. formicicum . Also, the range of amino acid utilization is not increased in co-culture with M. formicicum . Strain GLU-3T does not grow on carbohydrates, gelatin, casein, pyruvate, succinate, malate, fumarate, α-ketoglutarate, mesaconate, β-methylaspartate, oxaloacetate, glycerol, ethanol, acetate, propionate, butyrate, lactate, citrate, leucine, lysine, alanine, valine, proline, serine, methionine, asparagines, phenylalanine and aspartate . The organism does not utilize sulfate, thiosulfate, elemental sulfur, sulfite, nitrate and fumarate as electron acceptors . A. paucivorans GLU-3T, DSM 12260, was grown anaerobically in DSMZ medium 846 (Anaerobic Serine/Arginine medium)  at 37°C. DNA was isolated from 0.5–1 g of cell paste using the MasterPure Gram-positive DNA purification kit (Epicentre MGP04100) following the standard protocol as recommended by the manufacturer, with modification st/LALM for cell lysis as described in Wu et al. . The Phred/Phrap/Consed software package  was used for sequence assembly and quality assessment in the subsequent finishing process. After the shotgun stage, reads were assembled with parallel phrap (High Performance Software, LLC). Possible mis-assemblies were corrected with gapResolution (http://www.jgi.doe.gov/), Dupfinisher, or sequencing cloned bridging PCR fragments with subcloning or transposon bombing (Epicentre Biotechnologies, Madison, WI) . Gaps between contigs were closed by editing in Consed, by PCR and by Bubble PCR primer walks (J.-F.Chang, unpublished). A total of 259 additional reactions were necessary to close gaps and to raise the quality of the finished sequence. Illumina reads were also used to correct potential base errors and increase consensus quality using a software (Polisher) developed at JGI . The error rate of the completed genome sequence is less than 1 in 100,000. Together, the combination of the Illumina and 454 sequencing platforms provided 274.4× coverage of the genome. The final assembly contained 535, 052 pyrosequences and 15,007,632 Illumina reads.